The Poaceae (cried Gramineae or true grasses an aw) is a lairge an nearly ubiquitous faimily o monocotyledonous flouerin plants. Wi mair nor 10,000 domesticatit an wild species, the Poaceae represents the fift-lairgest plant faimily, follaein the Orchidaceae, Asteraceae, Fabaceae, an Rubiaceae. Tho commonly cried "gresses", seagresses, rashes, an segs faw ootside this faimily. The rashes an segs is sib tae the Poaceae, bein members o the order Poales, but the seagresses is members o order Alismatales. Gresslands is estimated tae compone 20% o the vegetation kiver o the Yird. 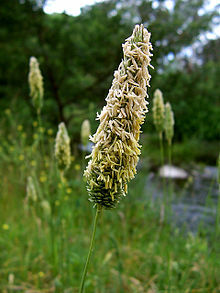 Poaceae leeves in mony ither habitats, includin weetlands, wids, an tundra. Domestication o poaceous cereal craps sic as maize (corn), wheat, rice, baurley, an millet lies at the foondation o sedentary leevin an ceevilization aroond the warld, an the Poaceae still constitutes the maist economically important plant faimily in modren times, providin forage, biggin materials (bamboo, thack) an fuel (ethanol), as weel as fuid. This page wis last eeditit on 7 Mairch 2015, at 22:38.